Manure Application to Alfalfa by John A. Lory, University of Missouri. Alfalfa has many characteristics that make it a desirable crop for manure applications. However there are significant challenges in managing manure on alfalfa. Manure Application to Soybeans by Matt Helmers, Iowa State University. 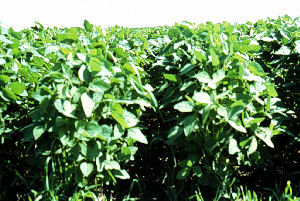 A 60 bushel/acre soybean crop in Iowa may remove up to 228 lbs of nitrogen, 48 lbs of phosphorus (P2O5), and 90 lbs of potassium (K2O) per acre. While there may be some economic, practical, and environmental reasons to apply manure to soybeans, there are also some disadvantages of such practices. Webcast Presentation discusses the ban Iowa is phasing in for manure application to soybeans. The web cast discusses what we currently know about managing manure applications to legume crops and the potential impacts on water quality. The presenters are Jim Baker and Matt Helmers, Iowa State University, Steve Herbert, University of Massachusetts and Charles Shapiro, University of Nebraska. 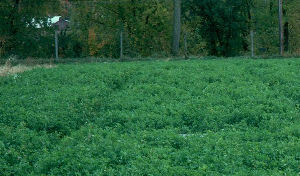 Alfalfa can serve as an excellent use of manure nutrients if manure is applied without the quality of the alfalfa stand. Photo: Stephen Herbert, University of Massachusetts.